BIRMINGHAM, Ala. – A study published today by scientists at University of Massachusetts Medical School and the University of Alabama at Birmingham provides insight into the mechanism of action of the drug ataluren, which is showing promise in treating Duchenne muscular dystrophy and cystic fibrosis. In these and other inherited diseases, 10 to 15 percent of the single-base pair mutations that cause the disease create a misplaced, premature "stop" codon in the middle of the gene — causing the machinery of the cell to prematurely halt synthesis of the protein, which destroys its ability to function. Ataluren appears to persuade the machinery of the cell to "run" that stop sign and allow a functioning protein to be made. 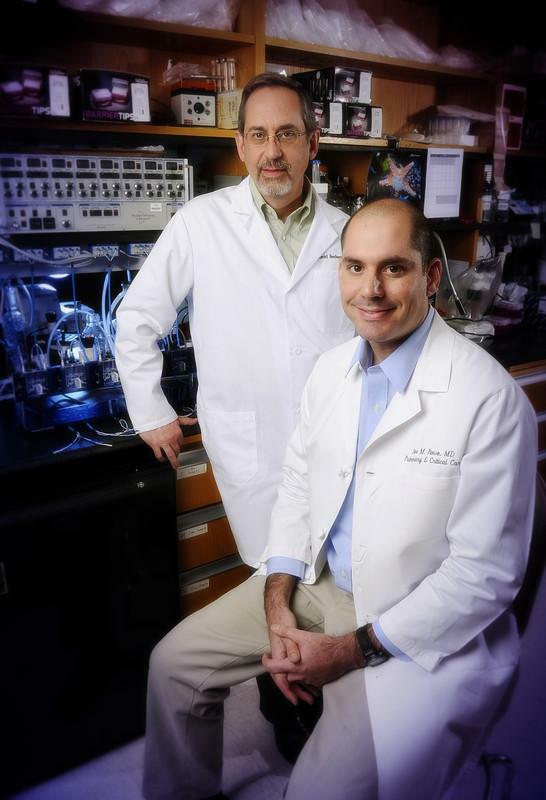 Allan Jacobson, Ph.D., of the University of Massachusetts Medical School and co-founder of PTC Therapeutics, the company that developed ataluren, and David Bedwell, Ph.D., professor of the UAB Department of Biochemistry and Molecular Genetics, have sought to understand precisely how ataluren allows the ribosome, the machinery of cellular protein synthesis, to skip over these inserted stop signs and produce proteins that have normal or near-normal function. The key question was this: What kind of amino acid gets inserted in place of the mutant stop sign? Is it one that is similar to the amino acid that would have been placed there in a nonmutated gene, thus making it more likely that the protein will be able to function like the original, nonmutated protein? Or does the drug allow insertion of dissimilar amino acids that may distort the structure of a read-through protein, preventing it from normal function? To answer this question, the researchers created numerous premature stop signs, known as nonsense mutations, in test genes in human and yeast cells. They then looked to see what amino acids were inserted when ataluren allowed a skip-over of the premature nonsense mutation. In a paper in the Proceedings of the National Academy of Sciences, they report that ataluren acts at the ribosome, and it allows the insertion of amino acids that are similar to the ones that would have been present in the nonmutated gene. These similar amino acids are carried by what the researchers call near-cognate tRNAs. They also found that the proteins made during ataluren treatment were full-length, and that other aspects of normal protein synthesis were not disrupted. "These results further support our clinical findings demonstrating the production of full-length functional protein in nonsense mutation Duchenne muscular dystrophy and cystic fibrosis," said Stuart W. Peltz, Ph.D., co-founder and chief executive officer of PTC Therapeutics. "Given this mechanism, ataluren offers the potential for a new therapeutic approach for multiple nonsense mutation genetic disorders by targeting the underlying cause of the disease." "These results should enable predictions of better clinical outcomes with therapeutic nonsense suppression," the researchers write in their paper. "Ataluren stimulates ribosomal selection of near-cognate tRNAs to promote nonsense suppression." "Our new data is scientifically important because ataluren restores activity to genes inactivated by nonsense mutations, and as a result, it has the potential to do so much for a large number of very complex genetic disorders," Jacobson said. Besides Jacobson and Bedwell, authors are Bijoyita Roy, of the University of Massachusetts Medical School and PTC Therapeutics; John D. Leszyk of the University of Massachusetts Medical School; Westley J. Friesen, Yuki Tomizawa, Jin Zhuo, Briana Johnson, Jumana Dakka, Christopher R. Trotta and Ellen M. Welch, all of PTC Therapeutics; Xiaojiao Xue and Kim M. Keeling, UAB Department of Biochemistry and Molecular Genetics and the Gregory Fleming James Cystic Fibrosis Research Center; James A. Mobley, UAB Department of Surgery; and Venkateshwar Mutyam and Steven M. Rowe, Gregory Fleming James Cystic Fibrosis Research Center and the UAB Department of Medicine.